Mature young ladies? Courtney bit the inside of her cheek to stop from laughing. Plenty of adults had called Courtney mature for her age, but never Peyton or Savannah. Peyton was still rebelling after the jerk boyfriend she'd had in ninth grade had ripper her heart out, and Savannah was . . . she didn't want to say oblivious, because Savannah was loving and sweet, but she had been a lot more sheltered than Peyton or Courtney. As they walked through the Fashion Show Mall, Peyton discovered how it got its name when a runway rose out of the floor and shoppers gathered around. Lights beamed down on the models strutting down the runway to fast-paced music. The show was flashing, like everything else in Vegas. And remember - what happens in Vegas stays in Vegas . . . but that doesn't matter when you live there. Peyton, Courtney, and Savannah Diamond have not had an easy life. They're extremely poor, boarding on poverty, their mother is an alcoholic (and has been for a couple years) and she spends her money on alcohol instead of rent and food. Once things become truly bad, their father sends for them - literally sends for them. They have either never met or don't remember their father as their mother left him when Peyton was not quite two and Savannah had yet to be born. Each girl responds differently to this upheaval: Peyton looks at the situation with annoyance, Courtney level headed and practical, Savannah with a sense of hope. Each chapter is told from the POV of a different sister and Madison, the "Queen B" of the Goodman School. Michelle did an amazing job of giving each girl their own distinct personality and voice. While each chapter is titled with the name of the character we'll be viewing these events through, you soon do not need these because their voices become so prominent amongst the others. You have rebellion (Payton), responsibility (Courtney), nativity (Savannah), and just straight up bitchness (Madison). Of the four, I have to say Courtney is my favorite. She approaches the entirety of their situation with such levelheadedness that it's pretty admirable. While I don't think she makes the best decisions throughout the novel, she definitely doesn't make the dumbest. That's not to say that Peyton and Savannah are dumb, but I definitely want to shake and/or smack them. However, their actions are understandable as well. Peyton is angry that their dad has been absent for 15 years and Savannah, who is 15, is so naive that it kind of hurts. There is a good amount of character development within the sisters as well - Madison pretty much stays on a level plane. They grow throughout the novel, but not so much that the next two novels will be devoid of development.They still have a ways to go, but it's nice seeing them progressing. The addition of Madison's chapters was definitely a smart move on Michelle's part. Madison's chapters just add that certain something. I like the opportunity to see the Diamond sisters from the eyes of somebody who feels that she has much to lose through their arrival. Somebody who is out to make them fail and "put them back on the sidelines, which was exactly where they belonged." It's even interesting that she sees these girls as a threat when they are really anything but. My (minor) issue with the book is that it's rather romance heavy. As soon as the sisters make it to Vegas there are guys around every corner. It seems cliche that they're all interested in "new girls," but that's how it's played out. Some of the guys are genuine and some of them are playing a game. I would like to see more of these girls dealing with their lives being uprooted and doing an entire 180 than dealing with boys. I do think it's worth noting that while there's plenty of stock put into these romances (for some more than others), it isn't all sunshine and lollipops, even with the genuine ones. These are not love at first sight romances, but realistic and true to human nature - even if that certain someones human nature is of low quality. 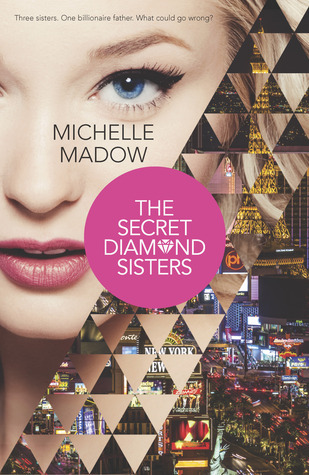 Overall, I enjoyed The Secret Diamond sisters. It was a fun and easy read that I found myself enjoying. The ending wasn't a cliffhanger, but nor was it a finite ending. There are issues that need to be resolved, questions that need answered, but that's what the sequels are for anyway. I love Michelle's teaser from the Q&A section in the end: "major secrets will be uncovered that will change everything" and there's the possibility that our feelings about certain characters will be completely different. Thanks for stopping by for a mini-interview, Michelle! I was more than happy to review The Secret Diamond Sisters for you - especially since I was such a huge fan of your Transcend Time Sage. How is writing The Secret Diamond Sisters different than writing the Transcend Time Saga? Well, you did it perfectly! As I mentioned in my review, even if you hadn't had chapter headings (which I loved that you did different fronts for each girl), I would have known exactly who was talking. Each girl had such a distinct voice/personality - never would have guessed it too "many rounds of edits" to accomplish that. If you were going to be best friends with one of the sisters, who would it be? Why? Definitely Courtney! Courtney is the sister who’s most like me. We have similar interests, and enjoy similar activities. She’s also the sister I would personally trust the most. Let's play a little make believe for this last question. You get a phone call saying you're related to a billionaire who owns a hotel on the Strip and they want you to come live with them in the hotel, much along the lines of the Diamond sisters. Which hotel would you want it to be? The Wynn, for sure! It’s my favorite hotel on the Las Vegas Strip, and it’s the hotel that inspired The Secret Diamond Sisters. The entire hotel is enchanting and mesmerizing. Walking through it is like being in Wonderland!